I could write a novel on our past five years.. but for the moment I will condense it..
Josie is our fourth child, we have three other wonderful children, lucy, luke, lilly and (ran out of L names) Josie... we had our 18wk scan on josie and was informed that josie had many problems and it might be best to terminate... You must be joking was our first reponse, I had just seen my beautiful baby on the moniter waving at me... this child was staying with me!!!! we chose not to have an amneo and just prepared that Josie was a downs baby..
My journey began in November 2007 after successfully gaining a placement for the practical side of my teaching. I started the teaching course with the usual worries would I manage and a whirlwind of what ifs that drove my poor mum and dad to distraction! I guess our first year of life with little James was a series of what we saw as only ‘coincidences’ of just small little issues. First he was in a harness, then a hip spica, some feeding problems, lots of physio and delayed milestones…..but it wasn’t until just after his first birthday that we were advised to see a Geneticist. Why would we need to do that we thought! 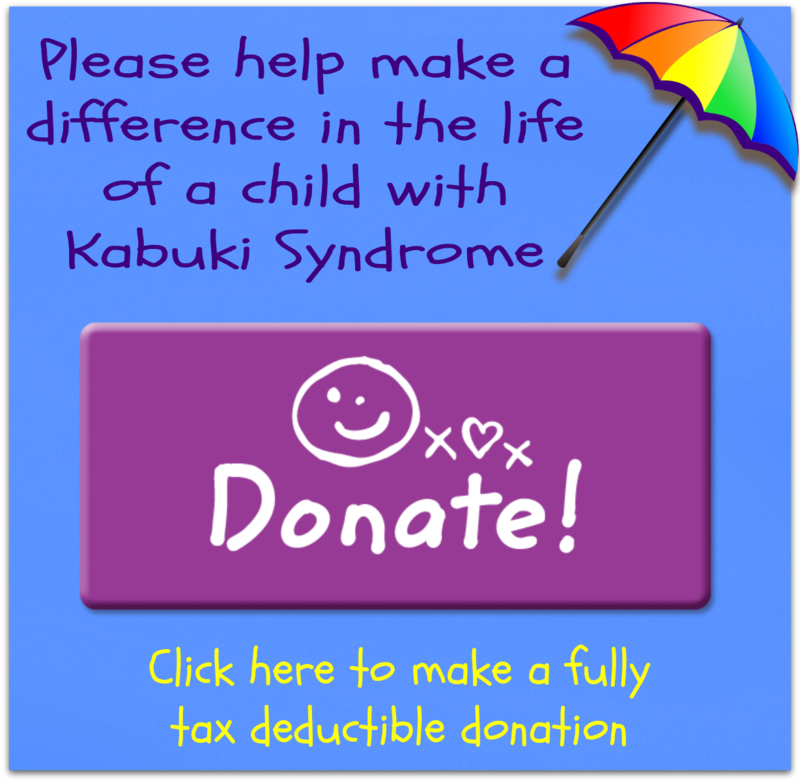 Our Geneticist was very kind man who was quite certain at our first meeting that James was a Kabuki baby, with characteristics including hypotonia, high arched palate, distinctive facial features, finger pads and developmental delay. What an eventful 11 years we have had so far in our beautiful girl’s life. I’ll start at the beginning when I had a problem free pregnancy and then labour started. From that moment on our world would change forever. We had a very distressed baby which was born by natural means with an Agpar score of only 2. She became stuck during the birth and didn’t breathe for the first few minutes of her life. The first thing we noticed was her club foot which we were told could easily be corrected through casting. 3 days later she had a temperature which remained for 2 days so we were sent to the children’s hospital in the neonatal section for a further 2-3 days. On Wednesday the 12th of December 2001, at 37 weeks pregnant, I went in to the Geelong Hospital to have an ultrasound. The doctors weren’t overly concerned but wanted to check our babies size, as it felt very small (and hadn’t grown in 5 weeks). I could tell that something wasn’t quite right, but nothing was said. I wasn’t told to see the docs immediately so I assumed it wasn’t to bad and as I was due to see the doctors in two days anyway we tried not to worry to much about it. At 2.30pm on Friday the 14th December I went in to the hospital for my appointment. Before I had even sat down the doctor (I can’t remember her name) told me that there wasn’t enough fluid around our baby and that it had stopped growing at least five weeks earlier, and was still very small (approx 5pounds). Then she told me I had to come in to the hospital in the morning to have a caesarian. I just looked at her, sat down, and then burst into tears. Then I stood up and just walked out of the room crying. Darrin (who was working at the hospital that day) arrived at that moment and took me back into the room to talk to the doctor. Everything was arranged for our babies birth the next day.